The RV park and campground links are below. If you know of any Wisconsin RV facilities not listed here, please submit them and we will get them listed in the WI rv directory. Our clean camping facilities and full time campground activities along with the 200+ modern, level campsites, from full hook-ups to rustic tent camping. Our campground is a family-friendly camping experience for the entire family. Fox Hill RV Park offers recreational activities, as well as plenty of room for relaxing. Across the street from beautiful Devil's Lake State Park in Baraboo, Wisconsin. Spacious RV Motorhome sites with water and 50 Amp electric service. Camp along the banks of the beautiful Sugar River. There are no full-hookups which discourages seasonal camping but emphasizes a simpler camping experience for motorhomes and trailers. With Miller Park, the Harley Davidson Museum and the Jelly Belly Factory all less than 30 miles away (and Six Flags just a tad more), we make a great base for side rv trips that will please the entire family. Join us for the best in family camping in a beautiful wooded setting. Highly rated, award winning family campground and resort located in southern Wisconsin. With 569 sites and 13 cabins distributed over 80 acres, we are sure to accommodate your family for a weekend of fun. Just a few miles from the beautiful bluffs of the Mighty Mississippi, we are conveniently located in the tri-state area of Wisconsin, Iowa, and Illinois, where there are endless activities and attractions for motorhomes. Whether you are looking for a weekend filled with activities or the quiet relaxation of a secluded campground, Smokey Hollow is the place for you and your family. RV camping in the rolling hills and valleys of Southern Wisconsin's countryside. Lake George is a clean spring fed lake ideal for swimming, boating and fishing. Sky High Camping Resort is a family camping destination with a beautiful view high atop the Baraboo Bluffs. We are located on 170 acres with a 10 acre pond in the center of all the campsites. Campground located on the Beautiful Lower Wisconsin State Riverway. There are trailer and tent sites encircling Lake Lenwood, some set back and some on the lakeshore. Campground offers 300 extra large sites in 5 different grassy and wooded areas. 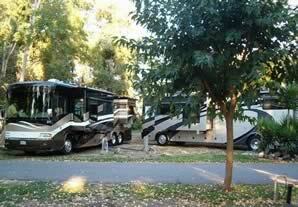 RV Park offers spacious campsites providing unusual privacy beneath a canopy of maple and beechwood trees. Dell Boo is a great family campground. Our goals are to have our park clean, quiet and friendly. RV Park located only four miles North of Wisconsin Dells and a short drive from Baraboo Wisconsin. Relax along the Upper Dells River at our waterfront or wooded campsites, available for tents, trailers & RV's. Enjoy the relaxed atmosphere of living on the beautiful Wisconsin River. River Bay Campground and Marina has its own private sheltered bay that is part of the Wisconsin River. From the moment you arrive, you will enjoy the quiet family camping among the pines and oaks of Sherwood Forest. Located in Wisconsin Dells, Minutes from the Downtown Wisconsin Dells Strip. We offer a variety of campsites from rustic tent sites in the woods to full hook-up sites with paved pads. Settle into a site just right for you with accommodations for all RV sizes and camping styles for motor homes and trailers. RV parks and Campground locations in Southern Wisconsin.